Rich, warm and generous in character, this full-bodied classic has been prepared to meet the demands of even the most discerning palates. Prized as a unique sweet wine specialty, Winexpert's Icewine - based on Riesling grapes - will surprise you with its body and complexity. 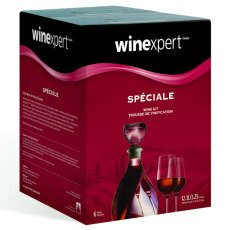 Winexpert's Selection Spciale Cabernet Franc Red Icewine Style is an intensely flavorful example of the traditional icewine styles produced in the Franconia region of Germany in the 1800's. Note: This wine kit may take up to a week to make it into our warehouse, so shipment timing will be delayed. Bursting with rich, intense flavors and aromas. This wine is a seven time Gold Medal winner in the Port Style category of the WineMaker International Amateur Wine Competition 2007 - 2013. Bright blackberry notes, lingering tannins and a gorgeous deep hue. This intensely flavored Port-style dessert wine is full-bodied and rich, with complex aromas of bittersweet dark chocolate. Gold medal winner in the Port Style category of the 2013 WineMaker International Amateur Wine Competition. This perfectly indulgent dessert wine is both sweet and luxurious. The velvety decadence of chocolate blends beautifully with rich, salted caramel and is sure to become a new favorite in your wine cellar! A superb blend of dark chocolate, refreshing peppermint, and rich coffee notes in a delicous dessert wine, available for a limited time only! Like Red Velvet cake in a glass; a luscious marriage of vanilla cake and cacao flavors, with a hint of dark berry. Full of luscious carmelized marshmallow flavor! Great after dinner, with dessert, or around the fire!